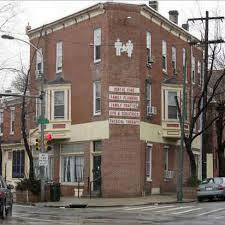 In March of 2000, Semika Shirelle Shaw underwent an abortion at Kermit Gosnell's Philadelphia office. Semika, a 22-year-old mother of two, called Gosnell's office the next day to report heavy bleeding, but according to court documents she was not instructed to seek care. Two days later, she died of sepsis and a perforated uterus. This is a follow-up to Jivin' J's examination of the claim that women were "forced" to go to Gosnell's discount abortuary because his prices were so much cheaper. Gosnell had 2-tier pricing: Insurance billing price and Discount Price (Medicaid & Cash). Gosnell's chemical abortion price was the same as Dr. Emily's -- $450. Gosnell: $330, plus between $50 and $150 for more anesthesia, for a price of up to $480. Gosnell also charged a "merchandising fee" if you used a credit card rather than cash. As you can see, Gosnell wasn't significantly cheaper, and in many circumstances was more expensive. Certainly he wasn't worth a trip from New York just for his cheap abortions. Nova Women's Health Care, Fairfax, VA: $345 - $495 depending on anesthesia. They didn't say how far into pregnancy they do these abortions; I've emailed them to find out. Prices are comparable for first trimester abortions at A Capital Women's Health. And as for women traveling from all over the Eastern Seaboard because Gosnell was so much cheaper, Preterm in Ohio has prices comparable to Gosnell's and does abortions up to 22 weeks. First of all, you have to give credit to the counselor for admitting that a 23 week fetus is six months and "fully grown." She's not giving any false information there. But from there on in, we're dealing with Clueless Claudia. She tells the patient that a 23 week abortion is done by suction and that "then they put it in a solution and send it to a lab to measure everything and make sure that everything came out of you." At 23 weeks there's no question. Two arms, two legs, a skull, a spine. This woman is describing a first trimester abortion, not a 23 week abortion. They might send a 23-week fetus to the lab, but not to make sure the abortion was complete. Now, she says that "they start falling apart." That sounds like a two-day D&E with an injection to kill the fetus on the first day. But the fetus doesn't "fall apart." It does have to be dismembered. Clueless Claudia then says that if the fetus comes out in one piece, it's "very small." Which means it's not 23 weeks. Though a 23 week fetus certainly can come out in one piece. The patient asks if the baby is "twitching, or something like that," and the counselor says "the solution will make it stop." At first this sounds like an admission of infanticide. But given how clueless Claudia seems to be about everything else, I think she's just saying something to get the patient away from the idea of a live birth. Especially when she says that "the whole purpose of the solution" is to make an intact fetus stop twitching. They put all the fetuses in the jars of solution, even when they come out in pieces, so obviously that's not the point of the solution. It's most likely a preservative. The counselor is evidently a bit freaked out by the patient's weird questions and starts talking about how the fetus has to be clean and fresh when it gets to the lab. All she knows is that the fetus goes in a jar to the lab and that this has something to do with disposal and something to do with making sure there's no retained tissue. Now Clueless Claudia says that the seaweed "kills the heartbeat." This sounds like the clinic does a digoxin injection, which is in keeping with the assertion that the fetus "starts falling apart". The digoxin kills the fetus and that allows the fetus to start ... sort of decomposing so it comes apart easier. The digoxin injection will be given at the time they put the laminaria in, but the laminaria aren't what kills the fetus. Now we get to more damning stuff: The counselor tells the patient that if the fetus comes out at home, "Flush it!" Now the counselor tells the patient not to go to the hospital because "the hospital won't take you. They won't touch you, either, because we started it. So whoever starts it has to finish it." Now, she's probably right that the hospital would refer her back if it turned out to not be an emergency situation, but it's not true that a hospital would refuse an abortion patient care. The "Don'tgo to a hospital; they won't treat you / know how to treat you" instruction is pretty standard, and pretty troubling. Then after Clueless Claudia tells the patient that the hospital won't touch her, she tells the patient "they might tell you to push it out." She says that King's County Hospital "tells patients to push out the pregnancy." So clearly the hospital will indeed treat the patient but will not extract the fetus if the patient is capable of pushing it out. Which also tells us that evidently a lot of their patients end up at King's County Hospital. So which is it? The hospital "won't touch you" or the hospital "will tell you to push it out"? Then the patient asks, "When it's alive?" But Clueless Claudia had already told the patient that the seaweed stops the heartbeat. Even if it comes out alive? "Yeah. And then I don't know what they do with it." What I can conclude from this half of the video is that Clueless Claudia doesn't know a lot of what goes on in the back and will just say whatever it takes to get the patient to relax and shut up. Then we switch to a different counselor. She describes the use of forceps, which sounds much more like a second trimester abortion, so at this point she's less clueless than Claudia. This woman says that if it comes out alive he has to resuscitate the baby and send it to the hospital. Much different form what Clueless Claudia was saying. This counselor is adamant that if the baby was born alive they'd send it to the hospital and the baby would then be the hospital's problem. She makes it very clear that this is the reason "termination is done inside." Yeah, the casual nature of the abortions so close to (and sometimes at) viability is disturbing, but what we have in this video isn't evidence that they do infanticide. It's that they're letting Clueless Claudia counsel patients when she has no idea what she's talking about. The second counselor said things that contradicted Clueless Claudia, and I get the feeling she had much more of an idea what she was talking about. And what's up with King's County Hospital and this clinic's patients? In Chapter 4 of Lime 5, Mona summarized the death of a 32-year-old California woman I'll call "Daisy." We learned of Daisy's death by ordering a database run of all deaths in California that met the ICD codes for abortion. Daisy was not a poor, ignorant woman. To the contrary, she was a systems analyst for a defense contractor. Daisy knew that abortion was legal and readily available. She had an appointment to abort her second-trimester pregnancy scheduled for April 30, 1990, at a local abortion clinic. However, for some reason, Daisy didn't wait for her appointment. On April 28, she allowed her boyfriend to insert a plastic tube into her uterus in a home-abortion attempt. Daisy died of complications of that abortion. 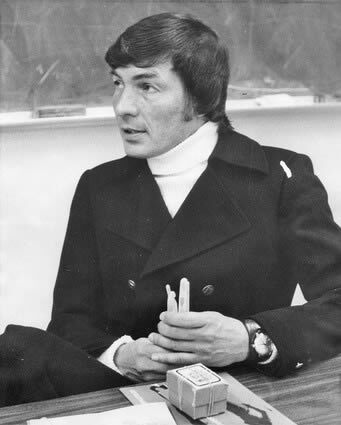 Survivors of Julia L. Rogers, age 20, alleged that she underwent a safe and legal abortion by Theodore Roosevelt Mason Howard (pictured) at Friendship Medical Center in Chicago on April 21, 1973. Julia's death certificate states that her death April 28 at Tabernacle Hospital was due to "bronchopneumonia and generalized peritonitis complicating extensive necrotizing endometritis and myometritis with sealed perforation." In other words, she developed pneumonia on top of peritonitis. A hole had been poked in her uterus, causing an infection that made the muscle tissue of her uterus start to rot inside her. Evelyn Dudley and Dorothy Brown also died after abortions at Friendship Medical Center. Sophia Berghusen of Brooklyn died on April 28, 1880, under the care of the mother-and-daughter midwife team of Mrs. Mary Kaufmann and Miss Margaret Kaufmann. The coroner concluded that Sophia had died of abortion complications. Both the Kaufmann women were arrested and tried but acquitted, though the sources do not say what was lacking in the case against them. On April 27, 1990, 28-year-old divorcee Sandra Milton underwent an abortion, performed by Dr. Carl Armstrong at Toledo Medical Services in Ohio. Sandra's abortion was performed at 10 a.m., and she was discharged shortly thereafter for the 90-minute drive home to Sandusky. The babysitter stayed with Sandra and her three children, ages 10, 7, and 5, for three hours as the young mother slipped in and out of consciousness and suffered pain and abdominal swelling. Twice the alarmed babysitter called the clinic, but was told that the symptoms were normal. The third time the babysitter called the clinic, she got no response at all, and summoned an ambulance. Sandra was pronounced dead on arrival at the hospital at 6:01 p.m.. The medical examiner found a one-inch uterine perforation. Her abdomen was full of blood. She had bled to death internally. Dr. Charles P. Wood admitted that Elvira Woodward had come to his house in Manchester, New Hampshire, on April 1 and remained there until her death on April 27, 1871. He said that she'd expelled a dead fetus on April 3, and that she suffered from puerperal fever. Elvira took ill, languishing and finally dying on April 27, at about 2:30 PM, at Wood's house, in the care of three doctors. Mysteriously, Elvira had attempted suicide by slitting her throat the morning of her death,though the extremely bloody wound had been only superficial.. Dr. Wood was convicted of performing the fatal abortion on Elvira. It is unclear how the prosecutor or the jury identified him, from among all the doctors who had attended Elvira, as the guilty party. Still, Elvira's abortion was typical of pre-legalization abortions in that it was performed by a physician. Regardless of where they stand on abortion, people are pretty united in their expressions of loathing and disgust for the behavior of Dr. Kermit Barron Gosnell, currently on trial in Philadelphia on first degree murder charges for killing viable infants who had survived abortions. Gosnell did this -- and trained his employees to do this -- by using surgical scissors to sever the newborns' spinal cords just below the base of the skull. Though Gosnell referred to this practices as "snipping," the word doesn't convey the nature of the act. Imagine, if you will, cutting through a chicken neck with kitchen shears. Over half a dozen of Gosnell's former employees came forward and testified to having witnessed and in some cases even participated in these "snippings." Yet in spite of the eyewitness testimony, in spite of the tiny bodies recovered from the freezer at Gosnell's "house of horrors," in spite of the nonsensical nature of the notion that Gosnell would have wrangled scissors through the spines of babies had such "snipping" not been necessary in order to, as Gosnell put it, "ensure fetal demise," the judge dismissed the murder charges against Gosnell for the deaths of three of those infants. The news was stunning. How could anybody fail to see the abundance of evidence that these infants had been born, had been struggling to live, and had been murdered? But such blindness, such unwillingness to recognize killing when it's done in the contest of an abortion, is not unprecedented. The William Waddill case springs to mind. Dr. William Baxter Waddill had initiated an abortion in a California hospital in February of 1977. The mother, a high school student, was at least 28 weeks pregnant. Waddill used a standard abortion method of the time, using a large syringe to remove as much amniotic fluid from the womb as possible and replace it with a strong sterile salt solution which typically ate away at the unborn child's fragile tissues -- skin, eyes, lungs, and digestive tract -- until the tiny body gave out. However, Waddill got a call from the hospital. "Baby W" had come out alive. Three nurses debated what to do with little girl, who was moving, crying, and making sucking motions. One of them summoned a nursing supervisor, who sent the baby to the nursery and summoned Waddill. When Waddill arrived, he found two nurses providing routine care to Baby W. Waddill then took over and proceeded to strangle the child to death in front of horrified witnesses including several nurses, an emergency physician, and a pediatrician -- complaining all the while that, "I can't find the goddam trachea," "This baby can't live or it will be a big mess," and "This baby won't stop breathing!" A pathologist examined the baby's lungs and concluded that she'd been alive for at least 30 minutes. The autopsy found the cause of the baby's death to have been "manual strangulation." The baby's gestational age was determined to have been 29 to 31 weeks. Waddill was charged with murder in the death of Baby W. All told, over 13 weeks of testimony, the witnesses described three unsuccessful attempts by Waddill to strangle the baby, and the fourth, successful, attempt. But during deliberations, the jury asked for clarification of a procedural point. A few phone calls to clarify the point led to the discovery by the attorneys and judge that there was a definition of "death" in the California health and safety code that the jury had not been informed of. Because the testimony hadn't directly addressed this particular definition of "death," the jurors became hopelessly deadlocked over whether Waddill's actions, though clearly causing what laymen would consider the "death" of the baby, had caused what the law would call the "death" of the baby. The judge had to delcare a mistrial. A second jury was also deadlocked, and the charges against Waddill were eventually dismissed. Think about it. A prosecutor in California was unable to even lock away a man who strolled into a NICU and strangled a baby in front of half a dozen witnesses. Let's just say I'll be disgusted, but by no means surprised, if Gosnell walks out of that Philadelphia courthouse a free man. On April 23, 1920, 30-year-old homemaker Violet McCormick died at the Chicago practice of an abortionist named Achtenberg, leaving behind three children ages 12, 9, and 6. Fom information about other Chicago area abortion deaths, we can gather that the abortionist in question was Dr. Louise Achtenberg, who had already been implicated in the abortion deaths of Dora Swan in 1907 and Florence Wright in 1909. After Violet's death, Achtenberg was held by the coroner and tried, but acquitted, freeing her to cause the 1924 death of Madelyn Anderson. It is clear that unless law enforcement and the judicial system have the means and the will to lock up quack abortionists, doctors like Achtenberg will be able to ply their trade with impunity, just as Chicago abortionist Steve Lichtenberg continues to ply his trade in spite of the deaths of Deanna Bell in 1992, Nakia Jorden in 1998, Maria Leho in 1999, and Maria Rodriguez in 2000 at his National Abortion Federation member clinic. Another example of what happens when abortionists are allowed to operate at large swept through Oklahoma City. Marie Epperson died February 26, 1929 after an abortion by Dr. Richard Thacker, but he was not prosecuted for her death. He seemed to lay low for a while without killing anybody else. That all changed in 1932. Ethel Hestland died on April 3 from a criminal abortion; Thacker had signed her death certificate. He was implicated in the abortion deaths of Isobabell Ferguson on April 14. Ruth Hall on April 15, Robbie Lou Thompson on April 23, Lennis May Roach on April 24, Nancy Joe Lee on April 25. Had Thacker been sentenced to even 8 years for Marie's death, he would never have harmed another woman; he died of natural causes in 1937. There is very little information available about the women whose deaths we commemorate today. They died in Chicago, 3 years apart. On April 22, 1920, 28-year-old homemaker Sophie Krawczyk died in her Chicago home from an abortion perpetrated on February 27 by Mary Simkus, whose profession is listed only as "abortion provider." Simka was indicted for Sophie's death, but the case never went to trial. On April 22, 1923, 30-year-old Daisy Singerland died at Chicago's Robert Burns Hospital from complications of a criminal abortion performed earlier that day. On June 1, Dr. J.W. Lipscomb was indicted for felony murder in Daisy's death. Chicago seems to have been, and to remain, a hotbed of abortion activity, with maternal deaths continuing to this day, with the deaths of Nakia Jorden in 1998, Maria Leho in 1999, Maria Rodriguez in 2000, Tonya Reaves in 2012. Nakia and both Marias died after abortions at Albany Medical Surgical Center, a National Abortion Federation member whose premier physician, Steve Lichtenberg, had been chewed out at a NAF seminar for "playing Russian roulette with patients' lives." Tonya died after an abortion at Planned Parenthood. Surgery, gynecology & obstetrics, Volume 26 By Franklin H. Martin Memorial Foundation, American College of Surgeons, 1918 will give us a contemporary account.Dr. Julius E. Lackner: I reported 500 cases occurring in the service of Drs. Banga and Fninkenthal at the Michael Reese Hospital in the years 1900 to 1914. Of these 500 cases 4 died. Five hundred cases in 15 years. That's about 34 a year or one admission every 11 days. That hardly an entire ward full of septic abortion cases. And the mortality rate was less than 1%. And consider that this record predates blood transfusions and antibiotics. And, keep in mind, this case load is comprised of all women whose pregnancies ended before about six months, both naturally and due to criminal interference. Looking over my own records, which are rich in Chicago deaths due to the extensive historical Chicago and Cook County records available online, I am can see that there simply were not enough investigations of abortion deaths at hospitals in all of Chicago, much less at the one hospital, to support the claim of entire septic abortion wards, even if you go back early in the 20th Century when, due to the state of health and medicine, abortion deaths were far more common than they would have been in the 1960s. In fact, the entire Homicide in Chicago Interactive Database indicates only at most three abortion deaths at Cook County Hospital were investigated every year for the entire period (1870-1930) covered by the Database. Most years there were no deaths, or one death. Though of course the Database or its search spider may have missed some, surely they did not miss scores of cases annually, which would have to be the case if as many women were dying at Cook County Hospital as abortion proponents claim. Nearly two decades before the "Mothers Day Massacre" pulled off with Kermit "House of Horrors" Gosnell in Philadelphia, Harvey Karman was working at the Clinical School of the Psychology Department of the University of California at Los Angeles, seeking a doctorate in psychology. He was not licensed to practice medicine. Around early February of 1955, 26-year-old Joyce Johnson told her husband, Ben, that she was pregnant. They discussed an abortion. Somehow, the couple found out about Harvey's passion for abortion, and arranged for him to practice his hobby on Joyce. On April 6, 1955, Karman met Joyce in a motel room and, using a speculum, inserted a nutcracker into Joyce in order to perform an abortion. On April 8, Joyce's husband took her to St. Joseph's Hospital. She was examined by a Dr. Moss who diagnosed her as suffering from "an infected criminal abortion." The dead fetus was still in her uterus. She expelled it while at St. Joseph's. The defense also appealed on the grounds that the the DA unduly prejudiced the jury by bringing out in cross-examining Karman that he'd been convicted previously of a felony. The appeals court ruled that this was proper impeachment of a witness. Karman's defense further argued that Joyce's husband and friend were improperly granted immunity after they originally refused to testify. Karman's defense also claimed that the prosecution failed to prove that the abortion wasn't necessary to save Joyce's life. But the appeals court found that the testimony of Joyce's husband and friend that Joyce had been in good health settled that matter. Of course, pure logic would prove that matter, since Joyce was seeking an illegal abortion from an amateur in a motel room. Had her life been in danger, an ob/gyn would have been able to admit her to a hospital and perform the abortion there. Though Karman had finished serving his sentence before Jerry Brown was sworn in as California Governor in 1975, Brown was enamored enough of Karman's work to issue him a pardon. Joyce's abortion was unusual in that it was performed by an amateur, rather than by a doctor, as was the case with perhaps 90% of criminal abortions. However, it also stands out because Harvey Karman was treated like a real doctor by the abortion establishment. He was invited to train abortionists, and was celebrated by abortion advocates for having invented a suction cannula designed specifically for early abortions. Despite being an amateur, and despite the death of Johce Johnson and the fiasco in Philadelphia, on his death Karman was eulogized .as a champion of safe abortions. The Boston Bombing is leaving us with many decisions to make, among them how to talk about it, and when, and how. They had everything going for them and instead of making anything worthwhile out of their lives, they decided to seek significance by destroying other people's lives. 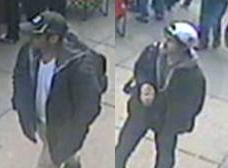 They don't deserve to be remembered as anything other than two blurry images, as Suspect One and Suspect Two. Period. Suspect One is dead. Suspect Two is in custody. They are now the problem of investigators and prosecutors. All the evil that they did, they did to get our attention. Well, screw them. They're not getting it. We say, "Remember the victims" and "Remember the heroes," but part of what makes that so difficult in such a massive event is that there are just so many. I propose that we choose two iconic examples, two men, and remember them. The man in the cowboy hat is Carlos Arredondo. Carlos had been a spectator, passing out little American flags. 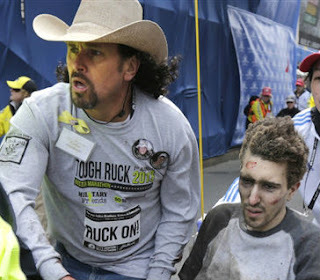 The injured man is Jeff Bauman. Jeff had been at the marathon to cheer on his girlfriend. The iconic photo of bystander helping victim would be striking enough to make these two men far more worth remembering than the suspects whose evil act brought them together. But the story goes even further than that. Carlos was himself a wounded man. An immigrant from Costa Rica, Carlos had been so devastated at the news that his son Alex had been killed in Iraq that he went inside the van of the Marines bringing the news and set himself on fire. Two years later, his second son committed suicide. This is a man that had been dealt blow after blow, but rather than allow himself to fall into helplessness or despair, became a peace activist, dedicated to preserving the memories of fallen servicemen. It was in that role that he was at the marathon, cheering on a man who was marching the marathon carrying a heavy rucksack in honor of Alex. When the bomb went off, Carlos ran. Toward the danger. Toward the young man whose life he would help to save. Jeff was just an all-American guy living an ordinary life. He worked at Costco, played the guitar, enjoyed sports, and was saving money to study civil engineering.When the bomb went off, Jeff went down. At first, he was in total shock, unaware of the extent of his own injuries, pleading with rescuers to help his friends first. He was loaded into a wheelchair, rushed to an ambulance, rushed to the hospital. It was there at the hospital that Jeff asked for a pencil and paper so he could scrawl eight words that would start him on the road from victim to hero: "Bag, saw the guy, looked right at me". Still being treated for devastating wounds, an ordinary young man began telling the FBI about the man in the sunglasses who looked him in the eye, set a bag at his feet, and walked off. Less than three minutes later, the bomb inside that bag exploded. With Jeff's help, investigators were able to look through video and identify the man in the sunglasses and the man who was with him: Suspect 1 and Suspect 2. Carlos Arredondo and Jeff Bauman are my heroes, two ordinary men who rose above tragedy and devastation to demonstrate everything that is good and brave and loving and resilient in the human spirit. It is my vow to them that the names of Suspect One and Suspect Two will never cross my lips. When the Boston bombing is mentioned, I sill speak two names in awed respect and admiration. Here's to you, Carlos Arredondo and Jeff Bauman. "In my gut, I am completely aghast at what goes on at that place. But I staunchly oppose anything that would correct this situation in law." No, this isn't recent response to the Kermit Gosnell trial. Ms. Compton-Carr was completely aghast in 1989, in Florida, when an investigation by the Miami Herald revealed that Dadeland Family Planning was reusing disposable instruments, that the doctors were leaving the facility while patients were still in recovery, that there were no nurses on staff, and that "Patient recovery was monitored by employees with no formal health-care training." The stirrups on the procedure tables were covered with blood. The oxygen mask had lipstick on it from the previous patient. Abortions were being sold to women who weren't actually pregnant. Richard Litt, who performed abortions at Dadeland until 1981, told the Miami Herald that he quit because the owners wanted him to do too many abortions in a single work day, and wanted him to do abortions too late into the pregnancy. He also complained that somebody in the clinic stole his prescription forms and forged his signature in order to get narcotics in bulk. Litt said that Dadeland "is a scum hole. I wouldn't send a dog there. They should be put in jail." But that wasn't the worst. A dying woman was given little more than tea and sympathy. They scraped her out, handed her some oral antibiotics, and sent her home to die of raging peritonitis. To reiterate, Ms. Compton-Carr, looking at the goings-on at Dadeland, and speaking on behalf of the reputable providers of Florida, might have been aghast, but she remained staunchly opposed to allowing anybody to actually rectify the situation. 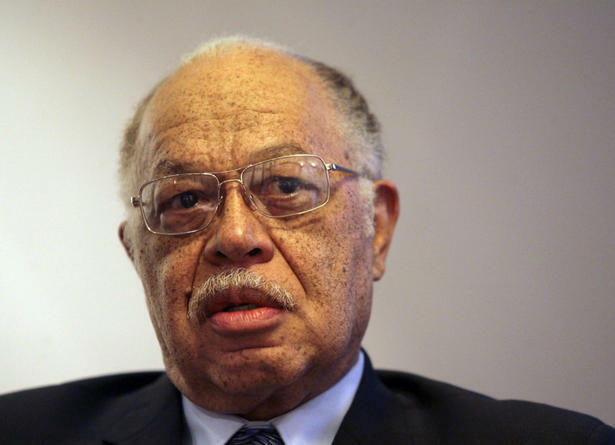 It was such touching devotion to access, the Grand Jury Report noted, that led prochoice politicians and bureaucrats to turn a blind eye to Kermit Gosnell's house of horrors in Pennsylvania during the ensuing quarter century. Nothing has changed. In 1991, when 60 Minutes was investigating an abortion mill where one woman had been allowed to die and another left incapacitated, reporters asked pro-choice Maryland State Senator Mary Boergers why nothing was being done to address dangerous abortion clinics. Boergers said, "There's only so much of a willingness to try to push a group like the pro-choice movement to do what I think is the responsible thing to do because they then treat you as if you're the enemy." Barbara Radford, then-president of the National Abortion Federation, defended the head-in-the-sand attitude the organization took toward safety issues by saying, "We want to make sure that women have choices when it comes to abortion services, and if you regulate it too strictly, you then deny women access to the service." Again and again, when foreseeable tragedy strikes, the abortion lobby will concede that malpractice isn't right, but nonetheless oppose and lament state action to address it. In 2006, staff at an Alabama clinic nearly killed a woman by ignoring her dangerously high blood pressure, giving her RU-486, and sending her home -- though she was eight months pregnant. The president of the Birmingham chapter of NOW called the clinic's closure "unfortunate". In some cases, the callousness of the abortion-rights response goes beyond tsk-tsking at the "outlier" (who has often been, as was the case with Abu "The Butcher of Avenue A" Hyat, a dues-paying member of the prestigious National Abortion Federation). No. In some cases, they actually leap to the defense of the seedy abortionist, as they did in 1973 after Benjamin Munson sent Linda Padfield home to die, in1984 after Raymond Showery let Mickey Apodaca bleed to death, in 1996 when Bruce Steir abandoned Sharon Hamplton to bleed to death, and in 2005 when Leroy Carhart let Christin Gilbert develop fatal complications in George Tiller's Wichita clinic. I know that my prochoice friends, neighbors, acquaintances and co-workers truly do care about women's lives. When will they stop entrusting those lives to a movement that has shown again and again that given the choice between protecting "access" and protecting women's lives, they will choose "access" every time? When will prochoice citizens stand up and start holding the abortion rights lobby responsible? Dusan Zivkovic and/or V. Perez had performed a safe and legal abortion on 35-year-old Brenda Benton at the notorious Biogenetics abortion mill in Chicago on March 13, 1987. She was placed under general anesthesia for the abortion. After she was discharged, Brenda developed fever, chills, and back pain. Brenda returned to Biogenetics to report these symptoms on March 27, and Zivkovic examined her and performed a D&C before transferring her to Martha Washington Hospital. There, Zivkovic called in other doctors for a consult. They then transferred Brenda to Rush-Presbyterian St. Luke's hospital on April 6. She died there on April 20. Her death was due to infection and "overwhelming septicemia." "Susanna Chisolm" and Synthia Dennard also died after abortions at Biogenetics. On April 20, 1938, 30-year-old Mrs. Doris Alexander died from an illegal abortion in San Francisco. Police concluded that the fatal abortion had been perpetrated on April 13. 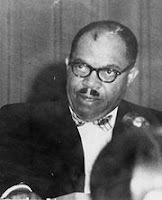 Dr. Clinton E. May, who had also crossed paths with the law when he harbored John Dillinger, was booked for murder in Doris' death. A nurse-assistant was sought by the police, and a man named Frances Zofell, age 48, was held as an accessory. May and Zoffell were convicted, May of second-degree murder, Zofell of conspiracy. In February of 1933, a 22-year-old unmarried store clerk, "Nina" Roe, informed her boyfriend that she was pregnant, and he got her some pills supposed to cause an abortion, but they didn't work. In March, the boyfriend got a drug called "duray." Nina took some in March and the rest on April 3 or 4, but this still didn't produce the desired abortion. On April 8, Nina went to a nursing home operated by a nurse to ask about an abortion. The nurse provided information that enabled the boyfriend to arrange for Dr. E. T. Martin to do the abortion. Dr. Martin then told Nina's boyfriend that the total fee, including a stay at the nursing home until Saturday night, would be $75. On Friday the 14th, Dr. Martin performed a curettage on Nina to remove the fetus. The nurse claimed that she had no idea what Dr. Martin was planning to do. >After the D&C, Nina became alarmingly ill. Dr. Martin said that he himself was not in proper physical condition to care for the patient, so he summoned a Dr. Templeton, who evidently cared for Nina at the nursing home until April 19, a Wednesday, when he advised staff to transfer Nina to Virginia Mason hospital. She died the following morning. Dr. Martin said that Nina had told him she'd missed three periods, taken abortifacients, had fallen, and had a chronic bowel condition. Dr. Martin testified that he'd recommended hospitalization, but that Nina wanted to avoid the possible publicity surrounding a hospitalization. It was then that he'd decided to send her to the nursing home instead. He also testified that she'd been bleeding from the 12th until the 14th, when he'd performed a curettage. He said that this curettage was necessary to treat her fever and bleeding. Dr. Martin was convicted of manslaughter in Nina's death, but the nurse was acquitted. On April 20, 1912, 19-year-old actress Ruth Fox died at her Chicago residence from septic peritonitis caused by an abortion perpetrated, possibly there and on that day, by Frank J. Schwartz, whose profession is not given. He was arrested and held by the Coroner on may 2, and indicted by a Grand Jury on November 25, but the case never went to trial. In the early morning of April 18, 1981, 30-year-old Barbara Lerner was found dead from blood poisoning. The Centers for Disease Control investigated Barbara's death and designated it as due to a legal abortion. "Sandra" was 18 years old when she underwent a first-trimester abortion procedure in New York, under the state's liberal abortion law. 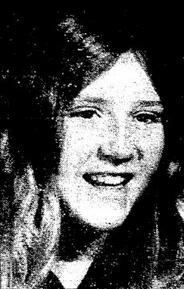 Three days later, on April 18, 1971, Sandra killed herself. Before her death, she had expressed guilt about having "killed her baby." Tragically, nobody had contacted Sandra to give her the results of the pathology report on what had been removed from her uterus. There had been no embryo. Sandra had not actually been pregnant. On April 18, 1908, 36-year-old homemaker Sophia Turner died in Dr. Jessie E. Robertson's Chicago office from complications of an abortion performed April 18. Robertson was acquitted for reasons not given in the source document. Sophia's abortion was typical in that it was apparently performed by a physician. I don't share their bewilderment over the "Women are sacred vessels" statement. I don't think it's vague. I think it's saying that women are meant to be the vessels that bear new life. I find it profoundly offensive because it comes across (maybe that's not how the speaker meant it) as dehumanizing the woman and reducing her to a mere womb to gestate a fetus in. So that one goes into my "Not just unhelpful but downright problematic" category. I think they're spot on with everything else, so give it a listen. Those insist that legalization of abortion is necessary to keep our daughters safe might want to speak to Lou Ann Herron's father, Mike Gibb, who silently wept in the courtroom as he listened to witnesses describe how his daughter died from a safe-n-legal abortion. On April 17, 1998, 33-year-old Lou Ann bled to death after a late abortion at the now defunct A-Z Women's Center. Medical assistant Sylvia Aragon wept on the witness stand as she said that Lou Ann's pregnancy was "too far along" for an abortion. Prosecutors said that Dr. John Biskind had ordered a total of seven ultrasounds performed, with estimates ranging from 23 weeks 3 days to 26 weeks. However, only the ultrasound that showed the pregnancy as 23 weeks 3 days was forwarded to the medical examiner; the others were lost or destroyed by the facility. The abortion was performed at 1:30 p.m.Two medical assistants testified that Lou Ann was very frightened about her condition as she lay in recovery. She begged, they said, to know what was wrong with her. She cried out in pain as she lay in a puddle of blood for three hours. Biskind fixed her IV (complaining that there was no qualified nurse on staff to do this), reassured her, and left the building at around 3:45 p.m. When the rescue crew arrived, Phoenix fire captain Biran Tobin Tobin testified that Lou Ann appeared to be dead. Nobody at the clinic seemed aware of how grave her condition was, he said, and nobody seemed to be helping her in any way. Staff told Tobin that Lou Ann's vitals were pulse 100, blood pressure 90/50. "It was very difficult for me to believe that they could get the vital signs of a woman who, even as we walked in the door, looked really dead," he said. "I very quickly felt that there wasn't a lot of competent medical care going on at the time." Emergency room physician John Gallagher testified that Lou Ann could have been saved had she been brought into surgery promptly. This assessment is in keeping with a CDC study concluding that given the training and resources available to physicians, no woman need bleed to death from a legal abortion. Gallagher testified that the records clearly indicated serious trouble at 1:25 p.m., 16 minutes after Lou Ann had been taken to the recovery room. During her last hours in the recovery room, Lou Ann became combative, anxious and frightened, and she reported that her legs were going numb. These, Gallagher noted, are all clear signs of severe blood loss. Instead of recognizing the danger she was in, Gallagher noted, Biskind instead tried to calm Lou Ann and reassure her that she would be "just fine." Only after the trial was over did members of the jury learn of Biskind's history of misconduct, including the previous death of another abortion patient. A-Z owner Moshe Hachamovitch's license had been suspended in New York for nine months on the grounds of gross negligence, gross incompetence, and inaccurate patient records. His license was again suspended in New York for practicing fraudulently and failing to maintain adequate records. Whether at his own hands or under his direction at his facilities, Hachamovitch was responsible for the deaths of seven abortion patients, nearly as many as were connected with two criminal abortionists, Dr. Richard Thacker and Dr. John Eisiminger, in the pre-atnibiotic, pre-blood transfusion days of the 1930s. You did an amazing job on this concise and pithy piece regarding Obama's failure to weigh in on the Gosnell trial when he had spoken strongly on the Trayvon Martin case at a far earlier stage of the game. "As I understand it, this puts the burden on the attending physician who has determined, since they were performing this procedure, that, in fact, this is a nonviable fetus; that if that fetus, or child -- however way you want to describe it -- is now outside the mother's womb and the doctor continues to think that it's nonviable but there's, let's say, movement or some indication that, in fact, they're not just coming out limp and dead, that, in fact, they would then have to call a second physician to monitor and check off and make sure that this is not a live child that could be saved." "Essentially, I think ... the only plausible rationale, to my mind, for this legislation would be if you had a suspicion that a doctor, the attending physician, who has made an assessment that this is a nonviable fetus and that ... labor is being induced, that that physician (a) is going to make the wrong assessment and (b) if the physician discovered, after the labor had been induced, that, in fact, he made an error ... that this was not a nonviable fetus but, in fact, a live child, that that physician, of his own accord or her own accord, would not try to exercise the sort of medical measures and practices that would be involved in saving that child. Now, if you think that there are possibilities that doctors would not do that, then maybe this bill makes sense, but I suspect and my impression is ... that doctors feel that they would be under that obligation, that they would already be making these determinations and that, essentially, adding an additional doctor who then has to be called in an emergency situation to come in and make these assessments is really deisgned simply to burden the original decision of the woman and the physician to induce labor and perform an abortion. ....I, at least, have confidence that a doctor who is in that room is going to make sure that they're looked after." I'll admit that I'd love to see him eat those words. Clearly his unshakable faith in abortion providers was unwarranted. "Julie" was only 14 years old when she underwent an abortion in New York, under their liberalized abortion law, on March 26, 1972. She had retained fetal tissue, which doctors tried to remove with additional procedures. During one of these attempts to complete the abortion, Julie's uterus and bowel were perforated. Julie underwent a partial resection of her bowel and drainage of an abscess. But despite these procedures, she developed septicemia and peritonitis, dying on April 16, a dubious beneficiary of the laws that had removed the threat of prison from abortionists who injured or killed their patients..
On April 16, 1920, 24-year-old Rose Lieberman died at Chicago's Grant Hospital from a criminal abortion. Dr. Herman J. Webber was arrested, along with Walter Biesse, but they were released. Webber was indicted by a Grand Jury in June, and released on $10,000 bond, but the case never went to trial. Webber was later implicated in the 1927 abortion death of Irene Campbell. Sixteen-year-old Maureen Espinoza underwent a safe, legal abortion at a doctor's office in San Antonio on March 28, 1997. During the abortion, the doctor punctured Maureen's uterus, but didn't note this in her medical records or say anything to her about it, indicating that he simply didn't notice. Maureen was sent home. On April 3, she went to the emergency room at Northeast Baptist Hospital. Over the ensuing days, doctors there performed two surgeries to try to save her life, but to no avail. She died on April 15, 1997. Abortion rights organizations would assert that while sad, Maureen's death was just an example of how all surgery has risks. But when you consider that most abortions prior to legalization were done by doctors, wouldn't the same "all surgery has risks" be to blame for most illegal abortion deaths as well? Let's look at a case in the past. On Tuesday, April 5, 1932, 22-year-old Ruth Hall went with her friends Helen and Margy to Dr. Richard E. Thacker's office in Oklahoma City to arrange an abortion. Thacker took Ruth back into his exam room for five or ten minutes. Thacker told her to return at noon the following day. She, Margy, and Helen returned as instructed, bringing Ruth's roommate, Elma, with them. Helen went into the procedure room with Ruth, while Elma and Margy waited. Thacker used a procedure fairly common in abortion practice of the time: packing the patient's uterus with gauze and telling her to remove it in 24 hours. Helen said that Thacker didn't examine Ruth at all, though he might have examined her on the earlier visit. Helen's friends kept close watch on her over the next few days. She seemed very sick, but after using the bathroom and passing something into the toilet she seemed to feel better. On Saturday Ruth's brother came as usual to bring his sister home to visit their parents. They arrived in the afternoon, and Mrs. Hall was concerned that Ruth didn't seem well at all. It wasn't until about 11:00 that night that Ruth finally told her mother about the abortion. Mrs. Hall called the family doctor, who consulted with her over the phone but did not come to check on Ruth. Evidently he told Mrs. Hall to call Ruth's abortionist, because Mrs. Hall promptly called Thacker and browbeat him into coming to take care of his patient. He got out a case of instruments, only washing his hands after Mrs. Hall reminded him. He used an iodine swab to clean out Ruth's body. Mrs Hall said that after he was finished he sat at the foot of the bed for some time, complaining to Ruth's family that he didn't approve of abortions, that he'd told Ruth that when she'd come to the office but "I could not turn her down. It seems like the more I try to help people lately the most of them get into worse trouble." He said that his wife would kill him if she knew about the abortions, and that he felt sometimes he'd be better off if he just jumped in the river." He finished by telling them, "Before I do anything like this again, the husbands will have to come with the wives, or the mothers with the daughters." Over the coming week, Ruth's condition didn't improve. Mrs. Hall asked Thacker if she could call another doctor but he said he didn't think it would be necessary. Finally on Friday, April 15, Mrs. Hall called the family doctor, another doctor named Ferris, and Thacker. By the time Thacker got to the house, Ruth was dead. Ruth's sister tried to shake Thacker down for funeral expenses, but he refused on the grounds that he'd done the best he could. The sister made good on her threat and Thacker fled, to eventually be tracked down in Springdale, Arkansas. During the trial, and over Thacker's understandable, albeit unsustainable, objections, the court permitted a number of witnesses to testify that after Ruth's visit to his practice, Thacker had performed fatal abortions on Robbie Lou Thompson, Lennis May Roach, and Nancy Joe Lee, who died on April 23, 24, and 25, respectively. 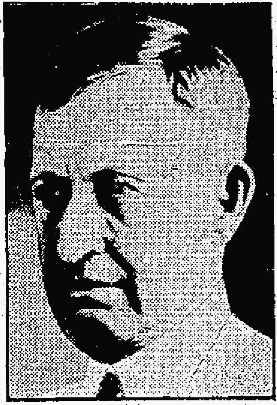 Thacker, along with osteopath John Eisiminger, had already been linked to the 1929 abortion death of 19-year-old Marie Epperson. Thacker and Eisimger seemed to have grown skittish after Marie's death, since they managed to go for three years without killing another patient. Thacker had signed the death certificate of 30-year-old Ethel Hestland, who died on April 3 from a criminal abortion, and it all went downhill from there. Thacker was sentenced to life in prison for Ruth Hall's death. He died in 1937. Had he been held properly accountable for the death of Marie Epperson, he would have been in prison and unable to perpetrate the fatal string of abortions in the spring of 1932. It is admirable that you led other Representatives in scolding the media for the lack of coverage of the Kermit Gosnell trial, but I am concerned that your aim is off. Chastising irresponsible reporting, while showing diligence, does not fall within the purview of the federal government. However, regulating interstate commerce very much does. Our member facilities care for more than half the women who choose abortion each year in [North America]. In order to become a member, a facility must complete a rigorous application process. Member facilities must comply with our standards for quality care, updated annually in our Clinical Policy Guidelines, which set the evidence-based standards for abortion care in North America. NAF periodically conducts site visits to confirm that our members are in compliance with our Guidelines. That any woman should walk into one of this highly lauded organization's member facilities, expecting cleanliness, professionalism, and high standards of care, yet end up doped within inches of her life by a rank amateur and left to moan in pain and anguish on a blood-stained blanket in a filthy “house of horrors” in another state is very much the business of Congress. Yet those six women who ended up in Gosnell's filthy mill are not the most tragic victims of NAF's false promises. Many have died from inexcusable malpractice. Information about these betrayed women is available at http://cemeteryofchoice.wikispaces.com/National+Abortion+Federation+Deaths. I urge you to lead responsible members of Congress, both prolife and prochoice, in an investigation of this corrupt organization. Both women whose deaths we commemorate today died in the 1930s at the hands of physicians, but the cases differ in significant ways. Mamie Ethel Crowell, age 20, died on April 14, 1930, in the office of Dr. Hans Paulsen, from an abortion performed on her that day. Two days later, Paulsen was booked for manslaughter by abortion. The father of the baby, Uriah Denniston, was booked as accessory. Paulson was held by the Coroner for murder by abortion. Denniston wasn't mentioned in the verdict. On September 1, the indictment was quashed. The source notes "Circumstances suggesting judicial corruption." I have found no evidence of Paulsen being involved in any other abortions. Either Mamie was a regular patient that Paulsen intended to help, or Paulsen kept a low profile and made a point of protecting the lives of the women who trusted him with their bodies. A practical nurse, Mrs. Luther Bryant Price, operated a private sanitarium in the Oklahoma City area. She told the County Attorney that several young women had come to the sanitarium for treatment after being injured by Thacker, but insisted that the abortions had not been perpetrated on-site. The 1932 deaths did not happen immediately after the abortions, leaving the police with a slew of dead women suddenly thrust upon them. They acted quickly, chasing Thacker out of state and prosecuting him for the death of Ruth Hall, resulting in a life sentence. Since Thacker died of natural causes in 1937, even an eight-year prison term after Marie Epperson's death would have permanently ended Thacker's practice and spared many women's lives. Criminalization of abortion can not protect anybody if the laws are not promptly and firmly enforced. Like, I think, the bulk of prolifers, I'd assumed that the lack of coverage of the Gosnell trial was deliberate. But what I've been seeing since the twitterfest has changed my mind. I think that by and large, Gosnell just sailed by under most reporters' and editors' radar. Let's face it, if you're prochoice, you're not going to pick up very quickly on an abortion scandal that doesn't take place under your very nose. But once the twitterfest blew the lid off, mainstream reporters picked up the fetid scent and many of them are on it. Let's take Connor Friedersdorf at The Atlantic, "Why Dr. Kermit Gosnell's Trial Should Be a Front-Page Story:"
Until Thursday, I wasn't aware of this story. It has generated sparse coverage in the national media, and while it's been mentioned in RSS feeds to which I subscribe, I skip past most news items. I still consume a tremendous amount of journalism. Yet had I been asked at a trivia night about the identity of Kermit Gosnell, I would've been stumped and helplessly guessed a green Muppet. Then I saw Kirsten Power's USA Today column. She makes a powerful, persuasive case that the Gosnell trial ought to be getting a lot more attention in the national press than it is getting. We made them aware. Let's justly praise them for what they've done once the blinders were taken off. Stella Saenz, age 42, had arranged for a aafe, legal abortion in the spring of 1968. On April 11, she was admitted to Los Angeles County General Hospital with sepsis. Doctors administered penicillin. Stella went into anaphylactic shock; neither she nor the doctors had realized that Stella was allergic to penicillin. Doctors tried to treat both the infection and Stella's reaction to the penicillin, to no avail. She died on April 13. The California Department of Public Health classified Stella's death as both a drug reaction death and a legal abortion death. Abortionist Raymond E. Showery (pictured) was out on bail appealing a murder conviction when he performed the safe, legal abortion that killed 28-year-old Mickey Apodaca. Mickey, a divorced mother of four, went to Showery's Southside Medical Center in El Paso for an abortion on April 11, 1984. She was about 19 weeks pregnant. During the abortion, Showery tore a hole in Mickey's uterus and severed a uterine artery. Mickey hemorrhaged for two hours before she was transferred to a hospital, where she died during an emergency hysterectomy. The prosecution charged that Showery used inadequately trained staff, failed to properly treat the injuries he'd caused Mickey, delayed treatment, and delayed transfer to a hospital.Showery performed Mickey's fatal abortion while out on bail pending appeal for his murder conviction. Several of Showery's employees had gone to the police and reported that Showery had drowned a baby girl who had survived a 1979 abortion. Showery was held pending $1 million dollars bail while awaiting trial for manslaughter in Mickey's death. While he was in prison, local pro-choicers rallied outside with signs asserting that Showery was "a good man" and that he "helps the poor." The fact that he helped Mickey Apodaca straight into an early grave was lost on them. Doris Jones, a 30-year-old mother of two, died April 11, 1935, from complications of a criminal abortion. Dr. Guy E. Brewer, a 53-year-old bachelor known for his benevolence toward college students, was fingered. Brewer was a quiet, small-town doctor in Garber, Oklahoma. Doris' husband, a grocery clerk, had not known about the abortion until after Doris took ill. Doris' abortion was typical of illegal abortions in that it was performed by a physician. On April 8, 1928, 26-year-old Mildred G. Jakobsen, a Chicago native, "took sick" at work. She died there before she could be taken to a hospital. On May 4, the Cook County coroner concluded that Mildred had died from complications of a criminal abortion, and recommended the identification and arrest of the person or persons responsible. Nobody was ever held accountable for Mildred's death. However, given Chicago practice at the time, it's highly likely that her abortion was perpetrated by either a doctor or a midwife. Today, our anniversaries are all of women who died from criminal abortions. Three died under the care of doctors, one under the care of a midwife. The earliest death is of 31-year-old widow Sarah Hall at the Grand Central Hotel in Chicago in 1874. Sarah, who was one of many boarders at the hotel, had been keeping company with "a prominent merchant" when she took ill. She was cared for primarily by her aunt and cousin under the direction of a Dr. Reynolds, which was an arrangement typical for sick people at the time. Reynolds went into a panic at Sarah's death, according to witnesses. He did the embalming himself at the hotel and prepared to ship Sarah's body to her family in Connecticut. The hotel proprietor and other residents thought the whole thing was fishy and notified the authorities, who intercepted the shipment and convened a coroner's inquest, which revealed that an abortion had been the cause of death. I've been unable to determine if Reynolds was definitively identified as the perpetrator. Those involved in the 1880 death of Anna Clemens did far more to arouse suspicions than did the people involved in Sarah's death. Rather than simply try to arrange a quiet burial, they dumped her body into the River Rough, just south of the village of Delray, Michigan, near Detroit. Anna's bloody cloak, with clumps of hair clinging to it, had caught on a spike on the bridge and thus prompted the search for her body. She was found dressed in black, bound and gagged. A stone had been tied to the clothesline which had been used to tie her hands behind her back. Anna had left her home on March 31, in good health and "excellent spirits." An investigation found that Anna and her fiance, businessman Thomas Merritt, had arranged an abortion to be done by Dr. W. G. Cox, who had been assisted by an elderly furniture repairman in dumping Anna's body. We have even scantier information on the 1906 death of Bessie Braun, a 22-year-old homemaker and immigrant from Austria, who died April 6 at Michael Reese Hospital. The source says that she died at the scene of the crime, but that's highly unlikely since Michael Reese Hospital was a reputable hospital. Midwife Julia Gibson was arrested in the Bessie's death. Sarah, Anna, and Bessie died in the pre-modern era, before antibiotics were available and when medical care could just as easily kill a patient as cure her, so it's difficult to argue that the legal status of abortion played a role in their deaths. During the first two thirds of the 20th Century, while abortion was still illegal, there was a massive drop in maternal mortality, including mortality from abortion. Most researches attribute this plunge to improvements in public health and hygiene, the development of blood transfusion techniques, and the introduction of antibiotics. Learn more here. Catherine Barnard of Arvada, Colorado died in 1969. 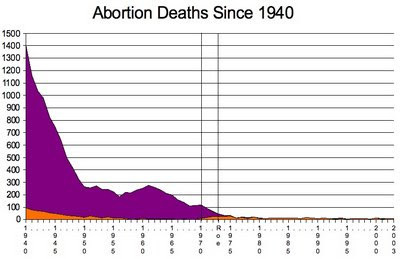 By this time, abortion mortality had resumed the downward trend it had followed for the previous century with the bewildering exception of the 1950s. Catherine had flown from her home to visit the Oklahoma City office of Dr. Virgil Roy Jobe. A cab driver testified that he'd picked Catherine up at Jobe's office and to take her back to the airport, but she ended up instead at South Community Hospital. There, doctors found her gravely ill from a punctured uterus and small intestine. They told her prior to surgery that they needed to know what had happened to her, and she told them Jobe had perpetrated an abortion. Other evidence also pointed to Jobe, including two prescriptions written by Jobe in Catherine's purse. Around 40 women, identified as abortion patients from Jobe's records, were questioned about his practice, and offered immunity in exchange for their testimony. Jobe, who was later also charged with performing an abortion on a 17-year-old Oklahoma girl, was convicted in Catherine's death. His office assistant, Mrs. Dorothy Ellen Whitten, was also charged with murder for Catherine's death. Other than the legal repercussions for those involved, the deaths of Joyce and Catherine seem no different from the post-legalization deaths of women who underwent abortions at the hands of licensed physicians.